Upgrade and strengthen the chamber. P.S. 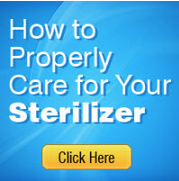 Here are the instructions on how to run this sterilizer. Unbelievably simple..
1. Place unit on a leveled surface. This will allow the chamber to fill with the right amount of water. 2. Fill reservoir 2 inches from top with distilled water. 3. Plug sterilizer into grounded outlet. 4. Put instruments on tray and into chamber. 5. While door open, turn bottom switch to 'fill' position, and leave at that position for about 50 seconds, until water reaches the front rim of the chamber. Please be sure timer is set on zero. *Note: Unit will not fill if timer is not on the off position*. 7. Make sure the middle knob is turned all the way clockwise. This will ensure 270f. By turning the middle knob counterclockwise...you will be reducing the temperature. 9. Turn the bottom switch to 'sterilize' position. 10. Both red & orange light will come on. 11. At end of cycle, the timer and both orange & red lights will be turned off and the pressure will be vented automatically. 12. When pressure gauge shows 'zero', you may open the door. 13. If you want the instruments to be dryer than they are...leave the door slightly open, and turn the bottom switch to vent position and set the timer to 10-15 minutes. * Important notice - Please do not attempt to adjust the front legs. They have been intentionally set this way*.